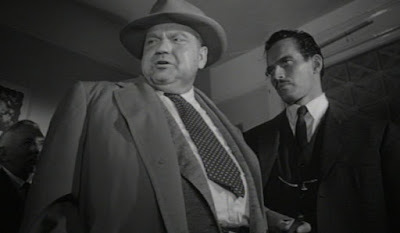 Orson Welles’s film Touch of Evil holds a special place in the hearts of many film noir enthusiasts as one of the most flamboyant examples of the genre. In many ways its visual and dramatic extravagance remains uneclipsed even today. 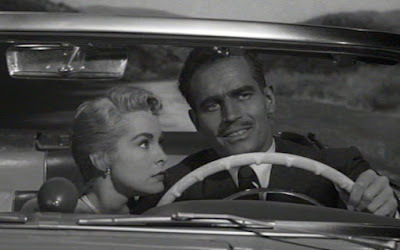 The film was not much of a hit at the box office when it was first released in 1958, due in part to Universal Studios’ cutting down and re-editing the film prior to its release, much against the director’s wishes. There have been some “restored” versions more appealing to cineastes since then, but even that bastardized first release was widely appreciated in Europe. It won the International Critics Prize (the top award) at the 1958 Brussels World Film Festival. 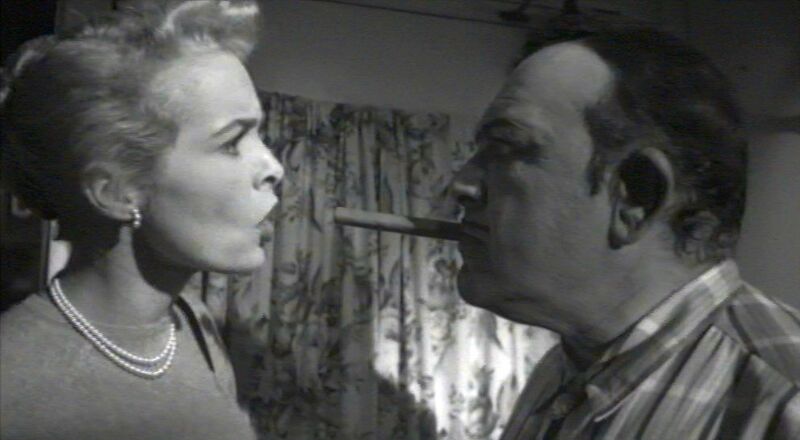 Since then, Touch of Evil’s reputation has steadily grown, and it is now ranked as an all-time classic [1,2]. In the British Film Institute’s most recent polls of film directors and critics concerning the all-time greatest films, it was ranked 57th on the BFI’s 2012 Critics’ Poll  and 26th on the BFI’s 2012 Directors’ Poll . 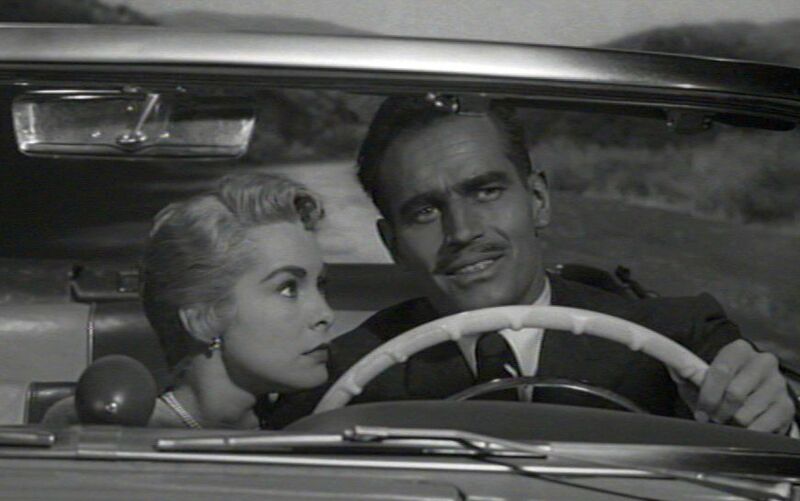 The story of Touch of Evil, which is loosely based on the novel Badge of Evil (1956) by Whit Masterson, concerns murder and corruption in two adjacent border towns straddling the U.S.-Mexican border. And besides incorporating the usual noirish equivocations concerning honesty, loyalty, and justice, it also included provocative slants on ethnic and social stereotypes. Welles and cinematographer Russell Metty told this dark story in a dramatic fashion, with their expressionistic, black-and-white rendering of mostly nocturnal scenes featuring many wide-angled moving-camera shots and quasi-threatening low-angled closeups. 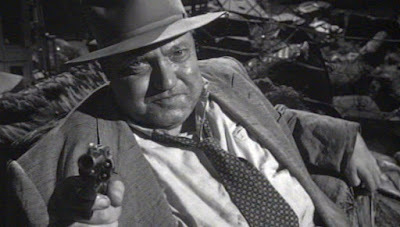 Police Captain Hank Quinlan (played by Orson Welles). He is a crafty but unprincipled cop who will use any means to ensure that the person who his intuition convinces him is guilty will be convicted of the crime. Although Quinlan, as the main character in this piece, would be expected to embody the highest standards of American justice, he in fact is shady, prejudiced, unscrupulous, and repulsive – the kind of person that simple-minded and prejudiced Americans (you can guess whom I mean) think is common in Mexico. Ramon Miguel “Mike” Vargas (Charlton Heston). He is a highly principled Mexican narcotics officer dedicated to seeing that justice is served in accordance with the full letter of the law. Mike Vargas is also handsome, romantic, chivalrous and heroic – the kind of person that typical audiences might assume to embody the “American” ideal. 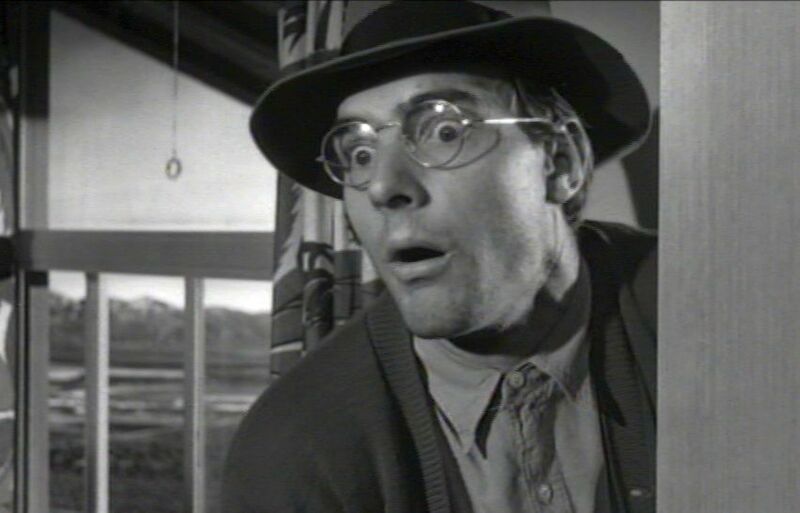 “Uncle Joe” Grandi (Akim Tamiroff). Although he is an American citizen, he is a Mexican gangster and current leader of the Grandi family criminal syndicate. He is slimy and ruthless, the epitome of the stereotypical Mexican villain. Susan Vargas (Janet Leigh). She is the newly married American wife of Mike Vargas. A beautiful and elegant blonde, Susie is probably another, in this case dreamlike, stereotype for a Latin American population (Janet Leigh may have been the ultimate Caucasian beauty icon – she was to serve in a similar role soon in Psycho (1960).) Like her husband, Susie is loyal, brave, and a believer in justice. But she also may hold her own personal stereotypical views, as evidenced when she calls a young Mexican man she meets, “Pancho”, which is perhaps an allusion to a character in the popular U.S. television series The Cisco Kid (1950-56). The film begins with one of greatest-ever opening shots – a more than three-minute crane-and-tracking shot that begins in one country and finishes in another. It starts with a time-bomb being surreptitiously loaded into the trunk of a car in a Mexican border town and then tracking the car as it is slowly driven through the border control into the U.S. Midway through the shot, it shifts its focus to a newly married couple, Mike and Susie Vargas, who are walking in the same direction across the border. When the couple are embracing on the U.S. side of the border, the shot ends with the sound of an explosion. 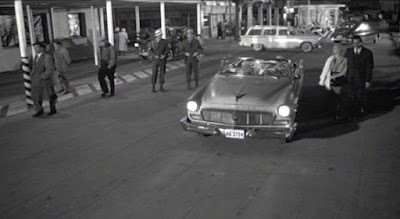 The time-bomb has gone off, destroying the car and its two occupants, one of whom was a wealthy American, Rudy Linnekar. So there is a murder case to solve, and Mike Vargas, knowing that the bomb was planted on the Mexican side of the border, feels he has to take part in the investigation. He sends his wife Susie back across the border to wait in their hotel while he looks into the matter. This separation of Mike and Susie introduces two parallel narrative threads that will intertwine throughout the rest of the film. At the scene of the crime, Police Captain Hank Quinlan shows up to take charge of the investigation. Quinlan is an obese and disheveled slob with an overbearing personality who relies on his fabled intuition to solve crimes. He is always attended to by his loyal assistant Pete Menzies (Joseph Calleia), whose life he once saved by taking a bullet intended for Menzies. In this case Quinlan immediately intuits that sticks of dynamite were used to commit the crime. He also adopts a scornful, dismissive attitude towards Vargas, whom he considers to be wandering outside his proper jurisdiction. Meanwhile, as Susie Vargas returns to her hotel, she is accosted by young thugs from the Grandi family who have been sent to her by “Uncle Joe” Grandi. Joe Grandi’s brother was earlier arrested and is facing trial in Mexico City based on evidence supplied by Mike Vargas, and Joe wants to intimidate Susie into getting her husband to back off from the case. So early on we see that Mike Vargas faces two hostile adversaries, one challenging his sense of justice and the other threatening his personal life. These two parallel struggles will gradually dominate the plot more than the original narrative quest, which was to solve the car-bombing crime. With their honeymoon plans disrupted, Mike consoles Susie and concedes to her that “all border towns bring out the worst in their country”. He reminds her of the positive side of things, that the U.S.-Mexico border is “one of the longest borders on earth. . . . an open border”, and he wants to work to keep things that way. Susie then insists that she wants to stay near her husband while he pursues his investigation on the U.S. side of the border. So he installs her and leaves her alone in a mostly vacant motel on the U.S. side that is tended by a tremulous night manager (Dennis Weaver). The night manager’s hyper-twitchy behavior only adds to Susie’s, and the viewer’s, nervousness. Little do they know that this motel is owned by the Grandi gang. As the car-bombing investigation proceeds, Quinlan identifies a prime suspect: a young man named Sanchez who had just secretly married the victim Rudy Linnekar’s daughter. 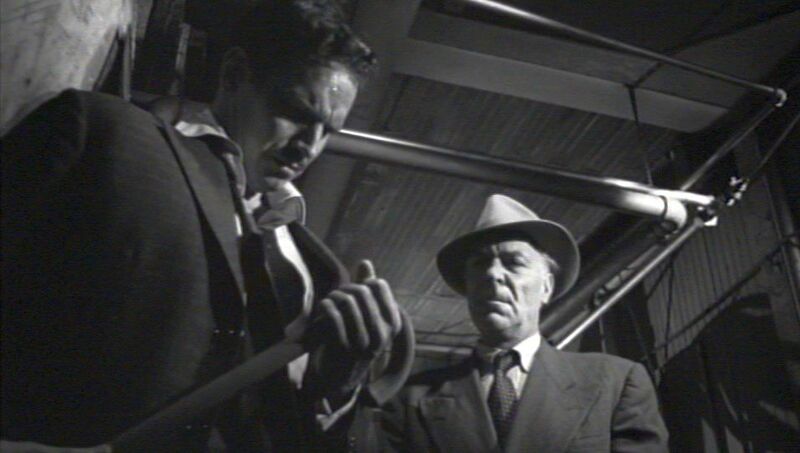 But during the search of Sanchez’s apartment, Vargas discovers by accident that the incriminating dynamite sticks that were found there must have been just recently planted there by someone. He suspects Quinlan of planting the false evidence in order to frame Sanchez. In fact Vargas begins to wonder if Quinlan has been doing this for years – framing his Mexican suspects with false evidence in order to guarantee criminal convictions. At this point Grandi privately approaches Quinlan seeking a clandestine alliance. After all, he tells him, they both need to get rid of their common enemy: Vargas. Then the scene shifts to Susie Vargas’s motel room, where she is attacked by Grandi family hoods, who then drug her and abduct her to a hotel room across the border. We can presume that Quinlan has bought into Grandi’s plan to frame the Vargeses as drug pushers and addicts. Although we know that Mike Vargas is a straight-arrow, the prevailing American prejudice against Mexicans makes Grandi’s plan feasible. Later that evening we get an insight into what drives Quinlan. At a bar, a half-drunk Quinlan melancholily talks to his long-time comrade Pete Menzies about his life’s great tragedy. His wife was strangled thirty years ago, and despite Quinlan’s relentless efforts, he was never able to catch the perpetrator. And he concedes that strangling is the most effective way to commit a murder, because the murder weapon is so hard to identify. Since then, he tells Menzies, he has always made sure that no culprit (identified presumably by his intuition) could ever go free. Unaware of the dire straits his wife is in, Vargas gets access to past court records in order to confirm his belief that Quinlan has been framing people for years by planting evidence that is discovered by his unsuspecting and loyal workmate, Menzies. While Vargas is trying to convince Menzies of his boss’s guilt, Quinlan goes to the Mexican hotel room where Grandi is waiting with the drugged Susie Vargas lying passed-out on the bed. Things have presumably worked out in accordance with their joint plan. But then Quinlan double-crosses Grandi by strangling him with Susie’s stocking. The idea is apparently to pin the murder on the presumed drug addict Susie. Eventually Menzies becomes convinced of Quinlan’s duplicity. The key piece of evidence was his finding in the just-seen hotel room Quinlan’s walking cane, which his somewhat inebriated boss had left there. So Menzies agrees to cooperate with Vargas in order to collect convincing evidence of Quinlan’s guilt. 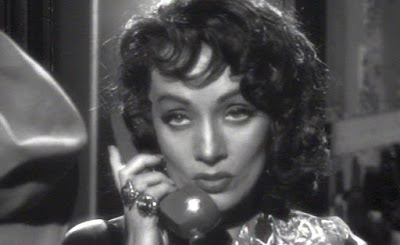 Their plan is to wire Menzies with a hidden microphone that can be used to record self-incriminating comments by the unsuspecting Quinlan, while Vargas will be lurking nearby with a radio-connected tape recorder. The scene is now set for the famous nighttime tracking sequence, in which Quinlan walks by a canal spouting his customary contempt to Menzies, with Vargas surreptitiously trailing them at a close distance in the shadows. 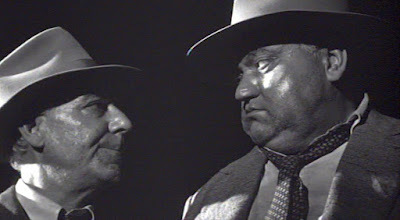 So Touch of Evil was really concerned with the struggle between Quinlan and Vargas, which amounted to a contest between upholding the community-based laws (Vargas) or sidestepping those laws in order to follow one’s selfishly-construed version of what is right (Quinlan). 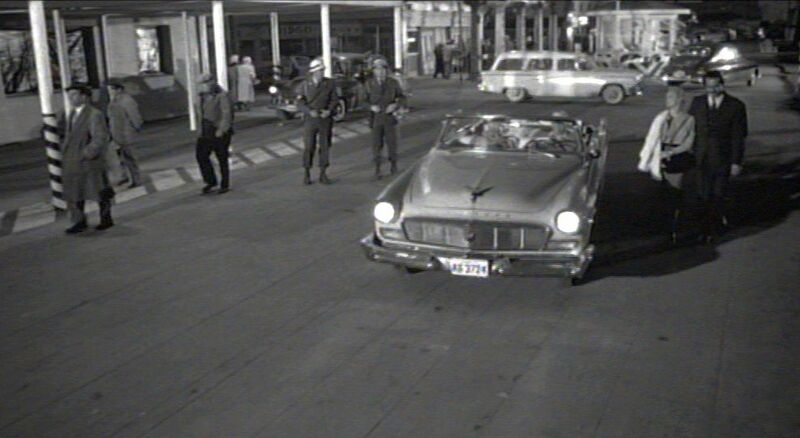 The original issue of solving the car-bombing crime had faded into the background. Indeed in the end we learn that Quinlan’s hunch was correct – Sanchez ultimately confessed to the authorities offscreen that he was the one who had put the sticks of dynamite in Linnekar’s car. But the point is that Quinlan was defying the way the way the legal system is supposed to work by planting false evidence in order to frame his suspect. The legal system is one of the four pillars, which I have labeled “RMDL” (the legal system is the ‘L’ in this acronym) , of rationalist-based modern societies that have arisen in the last couple of centuries. And it is the U.S. that is supposed to be the flagship country of this form of government. 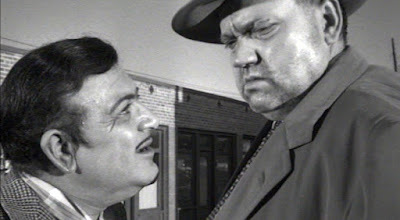 So in Touch of Evil the irony – one that jabs at some American ethnic prejudices – is that it is a U.S. citizen who defies RMDL and a Mexican citizen who staunchly upholds it. Welles spins this utterly dark tale in mesmerizing film noir fashion by continually shifting back and forth among his four iconic characters – Quinlan, Mike Vargas, Susie Vargas, and Grandi. One might criticize that these four characterizations are exaggerated and schematic. But their emphatic representations are just the right dramatic elements Welles needed to sustain his dark, complex, and expressionistic narrative. J. Hoberman, “Jokers Wild”, The Village Voice, (15 September 1998). Roger Ebert, “Touch of Evil (1958)”, Great Movie, RogerEbert.com (13 September 1998). Tim Dirks, “Touch of Evil (1958)”, AMC Filmsite, (n.d.).